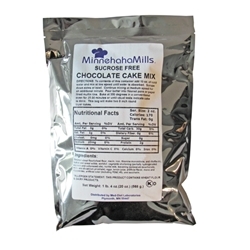 Moist, consistent quality cake mixes for sucrose restricted and low sodium diets. Ingredients: Enriched And Bleached All-Purpose Flour (Wheat Flour, Niacin, Reduced Iron, Phiamine Mononitrate, Riboflavin, Folic Acid), Sorbitol, Maltodextrin, Shortening Powder (Palm Oil, Maltodextrin, Sodium, Caseinate (A Milk Derivative), Dipotassium Phosphate, Mono And Diglyceride, Sodium Hexametaphosphate, And Silicon Dioxide), Non-Fat Milk, Potato Starch, Tapioca Dextrin, Xanthan Gum, Dried Whole Egg, Corn Oil, Baking Powder (Sodium Acid Pyrophosphate, Sodium Bicarbonate, Corn Starch, Monocalcium Phosphate), Baking Soda, Natural & Artificial Flavors (Dextrose, Corn Starch, Less Than 1% Turmeric, Less Than 1% Apo Carotenal, Alcohol, Less Than 2% Silicon Dioxide Added To Prevent Caking, Alpha Tocopherol (Vit E USP, FCC) Used To Protect Freshness), Sucralose, Cocoa Powder, Dark Caramel Color. CONTAINS: MILK, WHEAT.